LUNCHEON COST: $17. Contact Mary Shell at 859-6299 for reservations. Checks must be received by November 8th. There will be no exceptions. 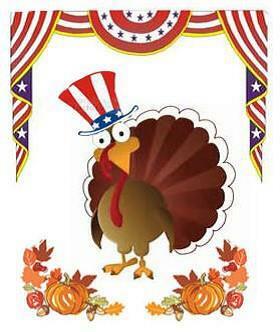 Our November Program features a Patriotic Sing-A-Long with entertainer Steve Chapman and Wear a HAT to Luncheon Day. Steve has been entertaining seniors for many years in northeast Florida. This is a great theme for Veteran’s Day which is in November. Steve’s program is more than just playing a keyboard and singing. It is interactive, humorous and nostalgic. He has performed for many organizations and even American Cruise Lines. Wear any kind of hat or even a fascinator. If you wear a hat you will get a ticket to be entered into a drawing for a prize. Sing, wear a hat and laugh as this an entertaining program! “ELF” at the Alhambra - December 6 - 11:15am: We purchased a block of 75 tickets to ELF for a special luncheon presentation at a rate of $29 per ticket for Members ONLY. This show is currently SOLD OUT, but you can contact Barbara Petty regarding cancellations. There will only be one choice of entrée at this event. If you have questions, please contact Barbara Petty. Savannah Christmas Trip - December 1 - This trip is open to Members and Guests and is currently SOLD OUT. Cost is $101 per person. It will leave Kohl’s at 8am by Deluxe Motorcoach and return to Kohl’s 7:30-8pm the same day and is a Destinations Unlimited tour. Lunch is included and will be at the Pirate’s House followed by time to browse/shop on River Street. Then we are off to the Savannah Theatre for a “Christmas Tradition.” Sign up at the October luncheon and make your check to Mandarin Women’s Club by November 15. If you have questions or wish to check on cancellations, please contact Barbara Petty. Travel - November 2 - We will be enjoying a tasting tour at Whetstone Chocolate in St. Augustine (139 King St.). The cost is $8.00 per person ($6.50 for 15+ people). Please bring cash on day of tour. (A hairnet will be required to be worn during the tour.) Tour starts at 10:30 am. We will leave from the Kohl's parking lot (by the street) at 9:30 am. Ride share is $7.00. Lunch is at Hurricane Patty's in St. Augustine (69 Lewis Blvd). Sign up at the luncheon or contact Leslie Lawrence. Antiquing - November 9 – Traveling to the quaint town of Micanopy to browse for antiques and unique handmade items for holiday gifts. We will visit the shops along the main street, stopping for lunch at “The Old Florida Café”, then continuing our shopping before heading home with our treasures. We will meet in the Hobby Lobby parking lot at 8:00 and leave promptly at 8:15. Riders share to drivers is $11.00. Call or email Linda Sherrod or Nancy Crowley or sign up at the luncheon. Mangia Mamas - November 16 - Please join us for a delicious meal and bonding experience at La Pentola in St Augustine. La Pentola is tucked away on a side street, 58 Charlotte St, but has its own parking lot. Go around the corner to a dirt driveway to their paved private parking lot with its own door to the restaurant. Lunch ranges from $11.95 to $19.95, and even the menu looks good enough to eat. We will meet at the front edge of Kohl’s parking lot closest to Old St Augustine Road; leaving promptly at 10:45am. Each vehicle will receive info on the restaurant and a map for the navigator. Riders share is $7 cash to your driver. Reservations are at 11:30am. Please sign up at the luncheon, indicating if you will drive, or contact your hostesses: Mimi Grenville or Tamara McKay. Good food and good friends make for a happy day! Mah Jongg - November 19 – will be played in the Hibiscus Building at Westminster Woods. Hibiscus (Building H) is on the right immediately inside the gates. Parking is very limited, so carpooling is necessary. Ann Dumire will email players monthly to set up car pools from Fresh Market. Play will still begin at 12:30pm. If you have any questions, contact Ann. Bridge - November 20 – will meet at 9:45am at the Ramada Inn, 3130 Hartley Rd. The cost is $16 cash, and buffet lunch is included. If you have any questions, or would like to join the sub list, please call Hannah Stefanides . Marathon Bridge - November 27 – takes place at 10:00am at the Ramada Inn, 3130 Hartley Rd. on the 4th Tuesday of each month September through May except December. The cost is $15.00 cash, and includes buffet lunch. To join the sub list, or if you have questions, please call Mary Chapman.